A regular breeding resident and migrant; some birds occasionally linger into the early winter months. The Vesper Sparrow was a common species during the Minnesota Breeding Bird Atlas (MNBBA). Broadly distributed from eastern British Columbia south to northern California, Nevada, northern Arizona, and New Mexico, and east through the northern Great Plains and the northern half of the eastern deciduous forest region. The core of its breeding range is largely west of the Mississippi River, in the western Great Plains states, and in the southern Prairie provinces (Figure 1). Assigned a Continental Concern Score of 11/20 by Partners in Flight. A partial migrant; northern populations winter in the southern United States and Mexico. A ground-foraging omnivore that feeds on arthropods and seeds. An open-cup nest usually placed on the ground at the base of a clump of grasses, forbs, or shrubs. Sometimes a small ramp leading up to the nest is present, as well as a canopy of bent-over vegetation. Breeding distribution and relative abundance of the Vesper Sparrow in North America based on the federal Breeding Bird Survey, 2011–2015 (Sauer et al. 2017). In the late 1800s and early 1900s, Roberts (1932) considered the Vesper Sparrow to be a common summer resident south of the densely forested region of the state, noting that it actually increased in abundance as one moved north from the Iowa border. Although not common in northern Minnesota, he wrote that “every clearing, old burned-over area, wind-fall, or cut-over region, has its considerable quota of Vesper Sparrows.” It was, he wrote, “one of the commonest and most generally distributed of Minnesota birds.” Confirmed nesting reports (nests with eggs) were available from Anoka, Crow Wing, Hennepin, Isanti, Polk, and Sherburne Counties and from Itasca State Park, Cass Lake, and Leech Lake. Inferred nesting reports (nests only) were reported from Goodhue and Lake of the Woods Counties. Green and Janssen (1975) reported that the Vesper Sparrow was a resident throughout Minnesota yet was least common in the northeast, where nesting was documented only as far as St. Louis County. Janssen (1987) further noted that the species was largely absent throughout Cook, Lake, and St. Louis Counties and uncommon in the north-central region as well. His distribution map eliminated the entire Arrowhead region as well as Carlton County and portions of Koochiching, Itasca, Aitkin, and Pine Counties. Within the species’ primary breeding range, he identified 20 counties where nesting had been confirmed since 1970. Hertzel and Janssen later added another 11 counties to the list. Beginning in the late 1980s, the Minnesota Biological Survey reported a total of 490 breeding season locations for the Vesper Sparrow. Common throughout the southern and western regions of the state, the species was least abundant in the Laurentian Mixed Forest Province, where the majority of records were found along the province’s western border with the Eastern Broadleaf Forest Province. A few records, however, were found as far east as Itasca and St. Louis Counties (Minnesota Department of Natural Resources 2016). MNBBA participants reported 2,768 Vesper Sparrow detections from 33.6% (1,601/4,761) of the surveyed atlas blocks and from 51.9% (1,213/2,337) of the priority blocks. Breeding evidence was documented in 109 (2.3%) atlas blocks (Figures 2 and 3; Table 1). The species was reported from every county except Cook and was confirmed breeding in 47 counties (1 block straddled 2 counties, Dakota and Rice). Twenty-five of the counties were additions to the list Hertzel and Janssen published in 1998. Included among the MNBBA records were 2 breeding detections in central St. Louis County, 1 in Babbitt and 1 from the tailings basin of the old LTV Steel Mining Company. Widely distributed and quite common in western Minnesota, the Vesper Sparrow was least common in extreme southeastern Minnesota, in the Twin Cities metropolitan region, and in east-central, north-central, and northeastern Minnesota. The MNBBA’s predicted distribution map demonstrates the species’ strong association with the agricultural regions of western and southern Minnesota (Figure 4). High breeding densities are predicted in southwestern Minnesota and along the Red River valley, gradually decreasing east through the Eastern Broadleaf Forest Province and the Laurentian Mixed Forest Province. In the latter, the species is only predicted to be present in low to moderate breeding densities along the very southern and western borders of the province and in the open landscape of the Iron Range in St. Louis and Itasca Counties. Forested floodplains appear to be one of the few areas in western Minnesota where densities are predicted to be lower. In the past one hundred years, the distribution of the Vesper Sparrow has changed very little. It remains uncommon in the densely forested landscape of northeastern and north-central Minnesota. Yet in areas where forest cover has been lost due to industrial or residential development, the species has found suitable habitat. The breeding records at the old LTV tailings basin are an example. The grassland cover planted on the reclamation site now provides ideal nesting habitat for this adaptable species. Historically, the Vesper Sparrow has made similar moves throughout its breeding range. As forests in New England and southern Canada were cleared, the species gradually expanded into regions where populations are now declining. Many of the farmlands have been abandoned and vegetation has either succeeded to forest or has been cleared for development (Jones and Cornely 2002). This general pattern has been observed throughout much of the eastern United States. Changes in the Vesper Sparrow’s distribution and abundance in Ontario are an excellent example. Biologists speculated that if the species was present prior to European settlement, “it was restricted to scattered natural openings caused by wildfires and to areas where Aboriginal peoples cleared and burned forests for corn fields, making ephemeral pockets of grassland habitat” (Cadman et al. 2007). As forests were cleared for development, numbers increased and populations expanded. But many lands cleared in the 1800s have been converted from farmland to urban and residential developments or have succeeded to mature forests. Although these changes have contributed to the species’ decline, more intensive agricultural practices are considered the primary culprit. As a result, Ontario witnessed a 29% decline in Vesper Sparrow populations between the first atlas, conducted from 1981 to 1985, and the second atlas, conducted from 2001 to 2005. The species’ primary breeding range has also shifted to the south and west (Cadman et al. 2007). Breeding distribution of the Vesper Sparrow in Minnesota based on the Breeding Bird Atlas (2009 – 2013). Summary statistics of observations by breeding status category for the Vesper Sparrow in Minnesota based on all blocks (each 5 km x 5 km) surveyed during the Breeding Bird Atlas (2009-2013). Summary statistics for the Vesper Sparrow observations by breeding status category for all blocks and priority blocks (each 5 km x 5 km) surveyed during the Minnesota Breeding Bird Atlas (2009-2013). Predicted breeding distribution (pairs per 40 hectares) of the Vesper Sparrow in Minnesota based on habitat, landscape context, and climate data gathered during the Minnesota Breeding Bird Atlas (2009-2013) using the General Linear Modeling method with an adjustment for detectability. Although it requires relatively dry, open sites with fairly short, sparse vegetation (Dechant et al. 2002), the range of habitats that meet these basic requirements is indeed broad, including native prairies, agricultural fields, roadsides, woodland edges, orchards, shelterbelts, and jack pine barrens (Figure 5). In Minnesota, the Vesper Sparrow may be found in habitats ranging from the intensively cultivated soybean and corn fields of southern Minnesota to young jack pine stands in the northwest, where the trees are sparsely distributed with a grass understory. Although the species does use Conservation Reserve Program (CRP) lands, studies conducted in Minnesota and North Dakota showed that it was more abundant in croplands than in CRP lands (Johnson and Schwartz 1993; Johnson and Igl 1995). Habitats identified within 200 m of MNBBA point counts where the Vesper Sparrow was detected were predominantly croplands, followed by upland grasslands (Figure 6). Indeed, in the middle of the fields of corn and soybeans, where few other species find suitable habitat, the Vesper Sparrow thrives as long as some tall vegetation is available for song perches. Edges are a common feature of many suitable Vesper Sparrow sites, such as fencerows or shelterbelts between fields, roadsides bordering field edges, or edges between small woodlots and pasture. Trees and shrubs along the edges provide some of the singing perches that are important to the species (Dechant et al. 2002; Jones and Cornely 2002). Edges, however, have a cost associated with them, in that some studies have demonstrated that cowbird parasitism is higher when nests are located near field edges (Dechant et al. 2002). Detailed field studies in Wisconsin demonstrated the density of breeding birds was positively correlated with several factors, including the percentage of woody cover, the total number of dead stems, and the percentage of bare ground. Density was negatively correlated with vegetation height and density and with the percent cover of standing residual vegetation (Sample 1989). Wet grasslands with tall, dense vegetation were avoided (Sample and Mossman 1997). In Iowa, the presence of suitable song perches was the most important characteristic of preferred territories (Rodenhouse 1981). At least one study also has demonstrated that Vesper Sparrows show some sensitivity to the size of the habitat, preferring stands larger than 20 ha (Vickery et al. 1994). Typical breeding habitat of the Vesper Sparrow in Minnesota (© Lee A. Pfannmuller). Habitat profile for the Vesper Sparrow based on habitats within 200 m of point counts where the species was present during the Minnesota Breeding Bird Atlas (2009-2013). Using monitoring data collected by the federal Breeding Bird Survey (BBS), biologists have estimated the size of the continental population of the Vesper Sparrow to be approximately 34 million breeding adults (Rosenberg et al. 2016). In 2013, Minnesota was estimated to support 3.9% of the continental population (Partners in Flight Science Committee 2013), yielding a current statewide estimate of 1.3 million adults. The more intensively collected MNBBA data generated a considerably larger statewide population estimate of 3.5 million breeding adults (95% confidence interval of 3.3 to 3.8 million). Although the Vesper Sparrow is abundant in Minnesota, breeding densities are much higher farther west in the Great Plains (Figure 1). An average of 39 birds are detected per BBS route surveyed in the state each year. In North Dakota, the average is 44 birds, and in Montana it is 61 birds (Sauer et al. 2017). In Iowa, local breeding densities in roadside habitats averaged 27.6 nests per 40 ha; in croplands they ranged from 12 to 44 nests per 40 ha (Jones and Cornely 2002). Croplands in North Dakota supported an average of 1.8 to 2.9 pairs per 40 ha (Johnson and Igl 1995). In Minnesota, breeding densities averaged 3.8 pairs per 40 ha on CRP lands (Hanowski 1995) while less optimal habitats in the north supported only 0.02 pairs per 40 ha in the Chippewa National Forest and 0.01 pairs per 40 ha in the Superior National Forest (Niemi et al. 2016). Since the BBS began monitoring landbirds in the mid-1960s, the continental population of the Vesper Sparrow has experienced a significant decline of 0.85% per year from 1966 to 2015 (Sauer et al. 2017). Cumulatively, the population has declined 30% from 1970 to 2014 (Rosenberg et al. 2016). In Minnesota, the decline has been considerably steeper, averaging a significant 1.79% per year (Figure 7). The only physiographic region where the Vesper Sparrow is showing a statistically significant increase is in the Central Mixed Grass Prairie region, which stretches from Nebraska south to central Texas. Factors cited as likely responsible for the decline are twofold. As noted earlier, in the northeastern United States, the wide-scale succession of old farms to forests has eliminated suitable habitats throughout the region, as has increasing residential and urban development. Meanwhile, in the Midwest and Great Plains, increasingly intensive agricultural practices eliminate shelterbelts, hedgerows, and grassy field margins, increase the use of herbicides, and increase the frequency of mowing and haying, all of which significantly reduce reproductive success (Jones and Cornely 2002). 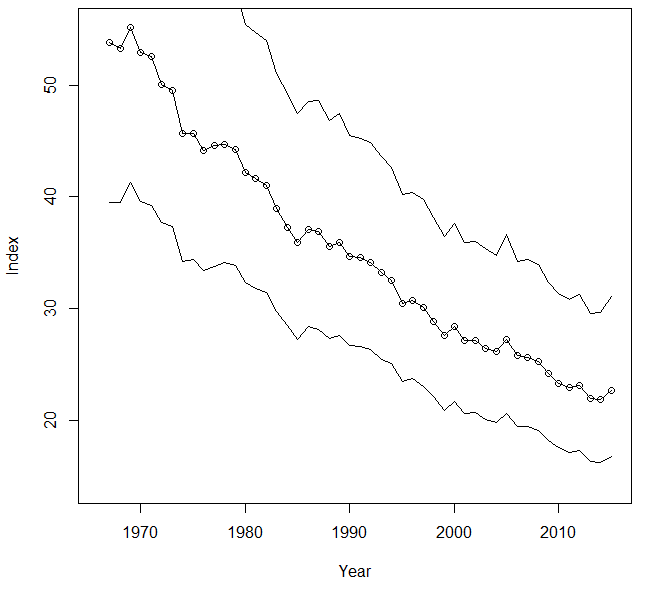 Breeding population trend for the Vesper Sparrow in Minnesota for 1967–2015 based on the federal Breeding Bird Survey (Sauer et al. 2017). Because of its relatively large population and widespread distribution, the Vesper Sparrow is not considered a species of conservation priority despite its declining population. It has been assigned a moderate Continental Concern Score of 11/20 by Partners in Flight (Rosenberg et al. 2016). The moderate score is influenced largely by its population decline coupled with concerns regarding threats to its breeding and wintering habitat. Specific management recommendations for the species are similar to those that benefit many grassland species. Although many management activities improve grassland habitats, such as mowing, grazing, and burning, they should be delayed until after the breeding season to avoid destruction of nests and flightless young. Given the species’ frequent use of croplands, farmers can take many actions to improve habitats, including retaining edge habitats created by hedgerows, shelterbelts, and fence lines. These provide important habitats and critical song perches in extensively cultivated landscapes. Breeding success on croplands also can be enhanced by no-tillage agricultural practices or by a reduced number of till operations. Tilling at approximately four-week intervals provides sufficient time for the species to complete a nesting cycle before the next pass of machinery (Jones and Cornely 2002; Dechant et al. 2002; Herrmann 2013). Finally, although The State of the Birds 2010 Report on Climate Change rated the Vesper Sparrow as having a low vulnerability to warming temperatures (North American Bird Conservation Initiative 2010), a more recent analysis by the National Audubon Society showed cause for concern. As part of an analysis of the potential impacts of a warming climate on nearly 600 North American birds, biologists predicted that the Vesper Sparrow could lose 73% of its current summer habitat by the year 2080 and classified it as “climate threatened” (Langham et al. 2015; National Audubon Society 2016). The sparrow’s ability to quickly colonize new sites as they become available may enable it to more readily adapt to a changing climate than other species as it is forced further north. The Vesper Sparrow is one of the few species that successfully inhabits the extensive cultivated landscapes of southern and western Minnesota. The sweet musical trills emanating from acres of corn and soybeans are a tribute to a bird that can find what may appear the most inhospitable of habitats suitable. The species’ significant decline, however, signals that it warrants closer attention if it is to continue as a common member of Minnesota’s avifauna. Johnson, Douglas H., and Lawrence D. Igl. 1995. “Contributions of the Conservation Reserve Program to Populations of Breeding Birds in North Dakota.” Wilson Bulletin 107: 709–718. Johnson, Douglas H., and Michael D. Schwartz. 1993. “The Conservation Reserve Program and Grassland Birds.” Conservation Biology 7: 934–937. Rodenhouse, Nicholas L. 1981. “Breeding Ecology of Vesper Sparrows in Corn and Soybean Fields.” MS thesis, Iowa State University. Sample, David W. 1989. “Grassland Birds in Southern Wisconsin: Habitat Preference, Population Trends, and Response to Land Use Changes.” MS thesis, University of Wisconsin. Sample, David W., and Michael J. Mossman. 1997. Managing Habitat for Grassland Birds: A Guide for Wisconsin. Madison, WI: Wisconsin Department of Natural Resources. Vickery, Peter D., Malcolm L. Hunter Jr., and Scott M. Melvin. 1994. “Effects of Habitat Area on the Distribution of Grassland Birds of Maine.” Conservation Biology 8: 1087–1097.